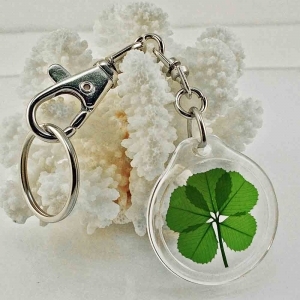 This lucky charm keychain has a real genuine preserved RARE five leaf clover enclosed in a see-thru acrylic pendant.. The silver tone keychain measures 3 inches. It has a double swivel trigger snap hook with a 1" split ring attached. You can also use it to attach to a Backpack, Lunchbox, Sports Duffle, Dance Bag, Jacket, Fleece, Winter Coat, Sleeping Bag, Purse, Tote Bag, Briefcase, Computer Bag, Luggage, or anywhere you want to. The pendant measures 1.375 inch in diameter. Keychain is gift boxed with a 5 leaf clover fact sheet and care sheet.